Normal Price £39.99 - Get £5 Off Today! 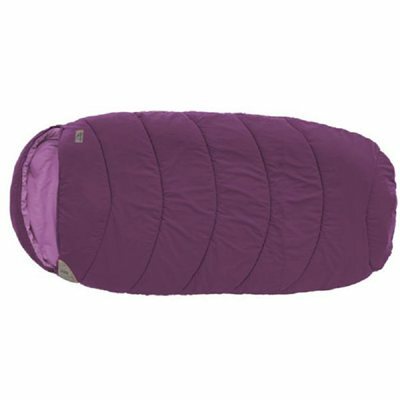 With their spacious, cocoon shape and lively colour combos, the new cosy Ellipse sleeping bags bring together the next-to-skin comfort of brushed polyester fabric of stiched-through polyester fibre insulation and smart stitching design detail. Perfect for summer camping, the two-way, open-ended zips can open at both ends to offer flexible opening and ventilation options. The large size gives you more room to move. Colourful, comfy and ultra soft, these are a splash of happiness on camping adventures, road trips, or for sleepovers at home. The spacious cocoon shape gives you lots of snuggle and wiggle room for a better night’s sleep. Special zippers at either end of the sleeping bag let you open up the top and bottom so you can stay cool on warm nights. And the price tag will make everyone smile. A great first sleeping bag for all ages.